(S)-(−)-N,N-Dimethyl-3-hydroxy-3-(2-thienyl)-1-propanamine (DHTP) is a key intermediate for the preparation of (S)-duloxetine, an important antidepressant drug. However, so far, the catalytic efficiency of (S)-DHTP synthesis by asymmetric bioreduction is yet limited. The present study aims to develop an efficient system for synthesis of (S)-DHTP by bioreduction. Various recombinant carbonyl reductases were evaluated for asymmetric reduction of N,N-dimethyl-3-keto-3-(2-thienyl)-1-propanamine (DKTP) to produce (S)-DHTP. The NADPH-dependent carbonyl reductase CR2 was identified as the suitable candidate, giving (S)-DHTP in absolute configuration. Then the fusion protein involving CR2 and glucose dehydrogenase (CR2-L-GDH) was constructed to further improve cofactor regeneration and resulted catalytic efficiency of the enzymatic reduction. By studying the effects of reaction conditions involving cofactor regeneration, suitable catalytic system was achieved for CR2-L-GDH catalyzing (S)-DHTP synthesis. Consequently, (S)-DHTP (>99.9% e.e.) with yield of 97.66% was obtained from 20 g L−1 DKTP within 8-h reaction, employing 40 g L−1 glucose and 0.1 mmol L−1 NADP+ to drive the cofactor regeneration, resulting in the space–time yield of 2.44 g L−1 h−1. Optically pure (S)-DHTP with improved yield was obtained by fusion enzyme CR2-L-GDH. Fusion enzyme-mediated biocatalytic system would be promising to enhance reaction efficiency of enzyme-coupled system for preparation of optically active alcohols. Optically active alcohols are valuable and promising chiral building blocks imposed in the production of pharmaceuticals, agrochemicals, functional materials, and fine chemicals (Munoz Solano et al. 2012; Ni and Xu 2012; Patel 2008). Optically active heterocyclic alcohols have been widely used as important precursors for the synthesis of chiral drugs (Huisman and Collier 2013; Pesti and DiCosimo 2003; Pollard and Woodley 2007). Using optically active heterocyclic alcohols as the key intermediate, (S)-duloxetine, the effective antidepressant and potent dual inhibitor of serotonin and norepinephrine reuptake (Bymaster et al. 2001), can be prepared in high optical purity. The preparation of single enantiomers of chiral intermediates has become particularly prevalent in the pharmaceuticals industry (Patel 2003, 2008). Currently, enantiopure chiral alcohols can be acquired by ether chemical or biological strategies. Compared with chemical synthesis, biocatalytic route has become a subject of considerable interest due to its high chemo-, regio-, and enantioselectivities, and mild reaction conditions and environmental benignity (Lalonde 2016; Ni and Xu 2012; Wohlgemuth 2010). In recent years, enzymatic asymmetric reduction of prochiral ketones for preparation of optically active alcohols has gained increasing favor (Nakamura et al. 2003; Nealon et al. 2015; Noey et al. 2015; Sun et al. 2016; Wang et al. 2011). Based on the retrosynthetic strategy, biosynthesis of (S)-(−)-N,N-dimethyl-3-hydroxy-3-(2-thienyl)-1-propanamine (DHTP) or its substituted derivatives has been identified as the straightforward and efficient way for the preparation of (S)-duloxetine (Fig. 1) (Ren et al. 2015; Tang et al. 2011; Wada et al. 2004; Zhang et al. 2015). Immobilized cells of Saccharomyces cerevisiae have been applied to produce (S)-(−)-3-N-methylamino-1-(2-thienyl)-1-propanol with the optical purity of 99% enantiomeric excess (e.e.) and conversion of 100% under the substrate concentration of 5 g L−1 after reaction for 48 h (Ou et al. 2014). Otherwise, the whole-cell catalytic system using Candida tropicalis has been developed to produce (S)-DHTP with 99% e.e. at the conversion of 84%, while the substrate tolerance of this system was merely 1 g L−1 (Soni and Banerjee 2005). Although optically pure (S)-DHTP can be prepared by biocatalytic reductions, the substrate concentration and the corresponding space–time yield of the whole-cell bioprocesses are yet limited. Therefore, it would be necessary to develop suitable carbonyl reductase and the corresponding enzymatic system for efficient synthesis of (S)-DHTP. Carbonyl reductases require stoichiometric amounts of nicotinamide cofactors (NADH or NADPH) as hydrogen donator for their activities. In situ cofactor regeneration would be feasible and prerequisite for practical application of carbonyl reductase-catalyzed ketone reductions. Of the cofactor regeneration approaches, enzyme-coupled system has been developed and is particular preferred for enzymatic reactions. Glucose dehydrogenase (GDH) as the coupled enzyme has been widely applied in NAD(P)H regeneration (Gao et al. 2013; Ye et al. 2010), due to its advantageous features of accessibility and practicability (Hall and Bommarius 2011). For enzyme coupling, construction of fusion protein has been developed as an effective method for cofactor regeneration, where two coding genes are combined by a short linker sequence to yield a single polypeptide exhibiting at least two functions (Calam et al. 2016; Farrow et al. 2015; Suehrer et al. 2014). The proximity effect of fusion protein generally reduces the intermediate diffusion distance and therefore increases the probability of intermediate undergoing a sequential reaction step before escaping by diffusion (Conrado et al. 2008; Dueber et al. 2009). In addition, the active sites of different enzymes for consecutive reactions can be brought in close proximity to accelerate the processing of intermediate through channeling (Castellana et al. 2014). Fusion protein of oxidoreductases would greatly facilitate the involved cofactor transfer between the two active centers of both the enzyme for catalysis and the coupled enzyme for cofactor regeneration, resulting in accumulation of necessary cofactor close to active center in some level and enhancement of desired biocatalytic reaction (Pazmino et al. 2008; Prachayasittikul et al. 2006). In this study, various recombinant carbonyl reductases were evaluated for asymmetric reduction of N,N-dimethyl-3-keto-3-(2-thienyl)-1-propanamine (DKTP) to produce (S)-DHTP. Then the NADPH-dependent carbonyl reductase CR2 was obtained as the suitable candidate catalyzing asymmetric reduction. To efficiently improve the preparation of (S)-DHTP, GDH was introduced to construct the fusion enzyme CR2-L-GDH. Finally, the fusion enzyme-involved reaction conditions were optimized, and compared with free enzymes involving CR2 and GDH, the fusion enzyme system was employed for the production of the key intermediate of (S)-duloxetine (Fig. 1). DKTP, (S)-DHTP, and (R)-DHTP were purchased from TCI (Shanghai) Development Co., Ltd. The cofactors including NAD(P)+ and NAD(P)H were obtained from Sigma-Aldrich (St. Louis, USA). Diethylamine, ethyl acetate, n-hexane, and isopropanol used for high-performance liquid chromatography were of chromatographic grade from Sigma-Aldrich (St. Louis, USA). All other chemicals used in this study were of analytical grade and commercially available. Fusion expression system containing CR2 (GenBank Accession Number: AB183149) and GDH (GenBank Accession Number: WP_013351020) was constructed using an aligned spacing sequence (GGGGSGGGGSGGGGS) as the peptide linker between them. The forward primer 5′-GGAATTCCATATGATGACATTTACAGTGGTGACAG GC-3′ and the reverse primer 5′-AGAGCCACCACCGCCAGAGCCACCACCGCCAG AGCCACCACCGCCCCCACGGTACGCGCC-3′ were used to amplify the fusion gene encoding CR2 and the linker. The forward primer 5′-GGCGGTGGTGGCTCTGGCGG TGGTGGCTCTGGCGGTGGTGGCTCTATGTATCCGGATTTAAAAGGAAAAG-3′ and the reverse primer 5′-ATAAGAATGCGGCCGCTTAACCGCGGCCTGC-3′ were used to amplify the fusion gene encoding the linker and GDH. The fusion gene cr2-l-gdh was cloned using the overlap-extension technique on the vector of pET-28a at the NdeI and NotI restriction sites. The recombinant plasmid pET-28a-cr2-l-gdh was transformed into the competent Escherichia coli BL21(DE3), and the positive E. coli BL21(DE3)/pET-28a-cr2-l-gdh was verified by DNA sequencing. The recombinant plasmid provides the fusion protein CR2-L-GDH with a six-His tag at the N-terminus. The recombinant strains expressing candidate enzymes for DKTP reduction and the recombinant E. coli BL21(DE3)/pET-28a-gdh expressing GDH used in this study were constructed and expressed previously in our laboratory (Table 1) (Li et al. 2016). For GDH and the fusion protein CR2-L-GDH, the medium for recombinant strains cultivation was Luria–Bertani (LB) broth containing 50 μg mL−1 kanamycin, and for CR2, the recombinant cells were cultured in LB broth containing 100 μg mL−1 ampicillin. Regarding all the recombinants used in this study, the cells were grown in 5 mL LB broth comprising the corresponding antibiotic at 37 °C and 200 rpm for 8–10 h. Then the culture was transferred into a 2000 mL Erlenmeyer flask containing 500 mL fresh LB medium with the corresponding antibiotic. When the OD600 value of the culture reached 0.6–0.8, 1.0 mmol L−1 isopropyl β-d-thiogalactopyranoside (IPTG) was added to induce protein expression. The cultures were cultivated at 17 °C for 14 h, and then the cells were harvested by centrifugation and washed three times with physiological saline for further use. The recombinant cells were suspended in Triethanolamine-H3PO4 (TEA buffer) (0.1 mol L−1, pH 8.0) and disrupted by sonication with an ultrasonic oscillator (Sonic Materials Co., USA). The cell debris was removed by centrifugation at 4 °C and 18,000×g for 30 min, and the supernatant was used as the crude enzyme for catalyzing the asymmetric reduction of the substrate DKTP. The concentration of crude enzyme was expressed as 2 g L−1 total soluble protein for biocatalytic asymmetric reactions in this work. The harvested cells were suspended in TEA buffer (0.1 mol L−1, pH 8.0) and treated with sonication using an ultrasonic oscillator (Sonic Materials Co., USA). The cell debris were removed by centrifugation (18,000×g, 30 min) at 4 °C, and the supernatant was applied to a HisTrap HP affinity column (GE Healthcare, USA) equilibrated with the buffer (20 mmol L−1 Tris–HCl, 0.3 mol L−1 NaCl, 40 mmol L−1 imidazole, pH 8.0) on an ÄKTA purifier system (GE Healthcare, USA). Then the absorbed proteins were eluted with a 40-min linear imidazole gradient buffer (0–0.5 mol L−1 imidazole, 20 mmol L−1 Tris–HCl, 0.3 mol L−1 NaCl, pH 8.0) at a flow rate of 3 mL min−1 and the purified fractions were exchanged into the buffer (20 mmol L−1 Tris–HCl, 0.3 mol L−1 NaCl, pH 8.0) using disposable PD-10 desalting columns (GE Healthcare, USA) (Li et al. 2016). The preparations of purified enzymes were applied to activity assay and measurement of kinetic parameters. The enzyme assay mixture in 100 μL for reducing DKTP or oxidating glucose activity of the purified CR2-L-GDH comprised 0.1 mol L−1 TEA buffer (pH 8.0), 5 mmol L−1 DKTP or 4 mmol L−1 glucose, 0.5 mmol L−1 NAD(P)H, or NAD(P)+, and appropriate amount of the purified CR2-L-GDH. The reactions for activity assay were carried out at 30 °C. The molar extinction coefficient of NAD(P)H was 6220 L mol−1 cm−1. One unit (U) of enzyme activity was defined as 1 μmol of NAD(P)H consumed or generated per minute under the assay conditions. The protein concentration was determined using Bradford reagents (Bio-Rad) as a standard. Initial velocities at various concentrations of the substrate DKTP (0.05–1.0 mmol L−1) or the co-substrate glucose (0.15–1.2 mmol L−1) were measured at 30 °C to obtain the apparent K m values of the purified enzyme CR2-L-GDH. For activity assay to calculate kinetic parameters, the cofactor of NADPH or NADP+ at saturated concentration towards the enzyme was added in the reaction mixture. The kinetic parameters were further determined from Lineweaver–Burk plots. The reaction involving free CR2 and GDH was carried out in 10 mL TEA buffer (0.1 mol L−1, pH 8.0) comprising 10 g L−1 DKTP, 100 g L−1 glucose, 0.02 mmol L−1 NADP+, appropriate amount of CR2 crude enzyme (total soluble protein 2 g L−1), and GDH crude enzyme with the activity equivalent to CR2. The fusion protein CR2-L-GDH-mediated reduction was carried out in 10 mL TEA buffer (0.1 mol L−1, pH 8.0) comprising 20 g L−1 DKTP, 40 g L−1 glucose, 0.2 mmol L−1 NADP+, and appropriate amount of CR2-L-GDH crude enzyme (total soluble protein 2 g L−1). The above reactions were conducted at 30 °C and 200 rpm for 12 h. After reaction, the mixture was centrifuged at 18,000×g for 30 min and the supernatant was extracted with ethyl acetate by vigorous mixing. The resulted organic layer was filtered through 0.22 μm PVDF syringe filter (Troody Technology, Shanghai, China) for further analysis. The reaction conditions were optimized by analyzing the optical purity and yield of product under various parameters, including pH values ranging from 7.6 to 8.6 (0.1 mol L−1 TEA buffer), reaction temperature varying from 20 to 45 °C, and DKTP concentrations ranging from 10 to 50 g L−1. To determine the optimal amounts of the added cofactor and co-substrate, the corresponding reaction parameters, involving NADP+ concentrations ranging from 0.005 to 0.2 mmol L−1 and glucose concentrations ranging from 5 to 200 g L−1, were analyzed for their effects on (S)-DHTP production from asymmetric reduction of DKTP by the catalytic system involving free CR2 and GDH or the fusion protein CR2-L-GDH. The optical purity and yield of (S)-DHTP were determined by normal-phase high-performance liquid chromatography (HP 1100, Agilent, USA) equipped with a Chiralcel OZ-H column (4.6 mm × 250 mm; Daicel Chemical Ind., Ltd., Japan) and a ultraviolet absorption detector. The analysis was conducted with a mobile phase consisting of hexane and 2-propanol and diethyl amine (80:20:0.1, v/v/v) at a flow rate of 1.0 mL min−1 and detected at 241 nm. The column temperature was set at 30 °C. The retention times for (S)-DHTP, (R)-DHTP, and DKTP were 6.51, 8.13, and 5.87 min, respectively. The e.e. value of DHTP was calculated based on the peak areas of (S)- and (R)-DHTP (Soni and Banerjee 2005). The recombinant enzymes used in this study were expressed according to the protocol involving optimized conditions as described previously (Li et al. 2016). Then the cell-free extracts of recombinant enzymes were employed for catalyzing asymmetric reduction of DKTP to produce (S)-DHTP. As shown in Table 1, only CR2 and KRD were active towards the substrate DKTP to produce the optically active DHTP in (S)-configuration (Fig. 2), while other enzymes showed no catalytic capability towards the substrate, indicating that most of the involved enzymes do not have obvious capabilities of acting to the substrate possessing heterocyclic group. Compared to KRD, CR2 was more efficient in the perspective of productivity (Table 1), and hence the carbonyl reductase CR2 was selected as the suitable enzyme for further biocatalysis. For the reaction system involving the crude enzymes of CR2 and GDH, the desired product (S)-DHTP with optical purity over 99.9% e.e. and yield of 90.43% was obtained from 10 g L−1 DKTP at 30 °C and pH 8.0, in the presence of 120 g L−1 glucose. When the substrate concentration was increased up to 20 g L−1, however, the yield of (S)-DHTP decreased significantly to 47.25%, which would be probably attributed to cofactor deficiency, besides the nature of substrate inhibition towards the functional enzyme. To further enhance the production of (S)-DHTP from DKTP reduction, GDH, as the coupled enzyme for recycling of the necessary cofactor, was supposed to be integratedly expressed with CR2 in a fusion form by introducing the peptide linker of aligned spacing sequence. The recombinant E. coli BL21(DE3)/pET-28a-cr2-l-gdh cells were induced with 1.0 mmol L−1 IPTG and supplied for SDS-PAGE analysis. 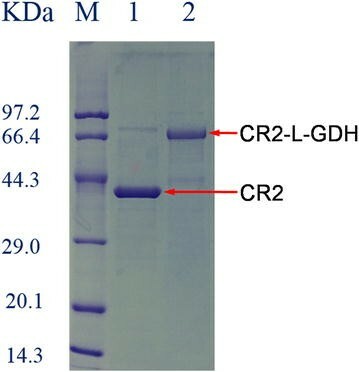 Comparison analysis between CR2 and the fusion protein on SDS-PAGE suggested that the fusion enzyme CR2-L-GDH was successfully constructed and expressed with the expected molecular weight, corresponding to the sum of both the theoretical molecular weights of CR2 (39.8 kDa) and GDH (28.5 kDa) (Fig. 3). As the fusion enzyme CR2-L-GDH involving both CR2 and GDH can be active towards both the substrate DKTP and the coupled co-substrate glucose, it would be necessary to evaluate the fusion enzyme by measuring its activities and kinetic parameters towards the two substrates, respectively. As shown in Table 2, the K m values of CR2-L-GDH towards DKTP and glucose were 0.32 and 0.47 mmol L−1, respectively, suggesting its comparable affinities for DKTP and glucose. On the other hand, CR2-L-GDH exhibited higher k cat/K m value to DKTP than to glucose, indicating the fusion enzyme was more favorable for catalyzing the bioreduction of DKTP and more glucose should be loaded in the reaction system. Using the cell-free extract of recombinant E. coli BL21(DE3)/pET-28a-cr2-l-gdh as the catalyst, with DKTP of 20 g L−1, optically pure (S)-DHTP (>99.9% e.e.) was obtained at the yield of 83.26% at 30 °C and pH 8.0 (TEA buffer). These results indicated that it would be much potential to improve the reaction efficiency under increased substrate concentration of 20 g L−1 by the fusion enzyme CR2-L-GDH. It is well known that pH plays a crucial role in biocatalytic reactions. The ionic state of substrate and enzyme, especially the local polarity of active site in enzyme, would be generally determined by the pH condition of corresponding reaction. Change of pH value of reaction buffer could not only influence the selectivity and activity of the functional enzymes involved in the reaction, but also the efficiency of the required cofactor regeneration in whole-cell or cell-free systems, which in turn affects the synthesis of desired product in terms of optical purity and yield consequently (Silva et al. 2012). For CR2-L-GDH catalyzing DKTP reduction, the optical purity of final product kept constant with the change of initial pH values, while the yield of (S)-DHTP was increased with the alteration of pH from 7.6 to 8.4 (Fig. 4a), which might be due to the generation of gluconic acid from GDH-catalyzed glucose oxidation. Thus, basic condition at initial pH 8.4 was favorable for CR2-L-GDH catalyzing DKTP reduction. Reaction temperature would also have obvious effects on activity, selectivity, and stability of biocatalysts including whole cells and enzymes, and even reaction rate and equilibrium as well. As shown in Fig. 4b, within the tested temperature range from 20 to 45 °C, (S)-DHTP was prepared with high optical purity over 99.9% e.e. However, the yield of the product was improved with the increase of reaction temperature from 20 to 40 °C, and higher temperature above 40 °C led to a sharp drop in the yield, which would be attributed to partial inactivation of the enzyme at a relatively higher reaction temperature. Therefore, the reaction temperature at 40 °C was considered as the favorable factor for CR2-L-GDH catalyzing DKTP reduction. The amount of substrate loading is a key issue for biocatalytic application potential. However, substrate inhibition has generally become a common issue for almost all of the biocatalytic processes (Zhang et al. 2014). Thus, effect of concentration of the substrate DKTP on the fusion enzyme CR2-L-GDH catalyzing asymmetric reduction was studied here to establish an efficient biocatalytic system for the production of (S)-DHTP. As shown in Fig. 5, substrate concentration did not have much impact on optical purity of the product, while the yield of (S)-DHTP decreased obviously with the increase of substrate concentration, especially when the amount of DKTP was increased from 20 to 25 g L−1 in the reaction system. The effect of substrate inhibition might be resulted from the toxicity of the non-natural substrate towards the enzyme. To further enhance the reaction efficiency of DKTP bioreduction, the substrate concentration of 20 g L−1 was adopted for the production of (S)-DHTP in term of the relatively higher space–time yield of 1.85 g L−1 h−1. Coenzyme recycling is one of the most important issues encountered in biocatalytic reductions. Glucose as the co-substrate with equal molar ratio to the substrate DKTP would be theoretically enough to drive the biosynthesis by the fusion enzyme CR2-L-GDH. For the cell-free system involving the fusion enzyme, however, there would be a series of biochemical pathways of metabolizing glucose. Therefore, excess amount of glucose should be added into the reaction system to completely promote cofactor regeneration for CR2-L-GDH catalyzing DKTP reduction. As shown in Fig. 6, by studying the effect of glucose concentration on DKTP reduction using the crude enzyme of CR2-L-GDH, addition of 40 g L−1 glucose in the reaction resulted in synthesis of (S)-DHTP (>99.9% e.e.) with the yield of 93.26% under 20 g L−1 DKTP after 10-h reaction. For cofactor regeneration, total turnover number (TTN) of the cofactor is defined as the number of moles of product formed from per mole of cofactor during the course of a complete reaction (Liu and Wang 2007). TTN generally indicates loss of cofactor due to degradation or incorrect regiochemistry of regeneration, and reaction rate and turnover number of biocatalyst (Zhao and van der Donk 2003). As shown in Table 3, the addition of less cofactor led to the increase of TTN. For the fixed substrate concentration of 20 g L−1, however, addition of 0.1 mmol L−1 NADP+ facilitated CR2-L-GDH catalyzing DKTP reduction, giving (S)-DHTP in the yield of 94.87%. After adjusting the fusion enzyme-catalyzed reaction by adding suitable amount of cofactor and glucose, during the reaction progress, optically pure (S)-DHTP (>99.9% e.e.) was produced from 20 g L−1 DKTP and accumulated at the yield reaching 97.66% under the optimal catalytic conditions after reaction for 8 h (Fig. 7), resulting in the space–time yield of 2.44 g L−1 h−1. In comparison with the previously reported literature (Ou et al. 2014), the substrate concentration was increased 5 times with 24-fold increase of space–time yield. Consequently, compared with the catalytic system involving free CR2 and GDH, the fusion enzyme CR2-L-GDH was more efficient for catalyzing asymmetric reduction of DKTP to produce optically pure (S)-DHTP, giving 2.1-fold increase of the production yield towards 20 g L−1 DKTP. On the other hand, (S)-DHTP was synthesized at the yield over 90% with the substrate concentration increased from 10 to 20 g L−1 (Table 4). Since the crude enzyme (total soluble protein 2 g L−1) was used at the fixed enzyme loading level, it would be promising to further improve the synthesis of optically pure (S)-DHTP under higher substrate concentration by employing more fusion enzyme of CR2-L-GDH and regulating the corresponding reaction process. The NADPH-dependent CR2 with excellent enantioselectivity was selected for catalyzing asymmetric reduction of DKTP to (S)-DHTP. To enhance the catalytic efficiency of CR2 catalyzing synthesis of (S)-DHTP via in situ cofactor regeneration, the chimeric gene encoding the fusion protein comprising CR2 and GDH was constructed and expressed as the fusion enzyme CR2-L-GDH. By regulation of the catalytic system and reaction process, the developed CR2-L-GDH catalytic system was achieved involving 20 g L−1 DKTP, 40 g L−1 glucose, and 0.1 mmol L−1 NADP+, under the optimized catalytic conditions at 40 °C and pH 8.4 for reaction 8 h. Consequently, optically pure (S)-DHTP (>99.9% e.e.) with the yield of 97.66% was obtained with increased substrate concentration of 20 g L−1 DKTP using the fusion enzyme CR2-L-GDH. Therefore, the fusion strategy for construction of multi-enzyme system would be promising in potential application for efficient biosynthesis of the precursor of (S)-duloxetine. YN, DW, and YX designed the experiments; TS and BL performed the experiments; TS, YN, and DW wrote this manuscript. All authors read and approved the final manuscript. Financial supports from the National High Technology Research and Development Program of China (863 Program) (2015AA021004), the National Natural Science Foundation of China (NSFC) (21376107, 21336009, 21676120), the Natural Science Foundation of Jiangsu Province (BK20151124), the 111 Project (111-2-06), the High-end Foreign Experts Recruitment Program (GDT20153200044), the Program for Advanced Talents within Six Industries of Jiangsu Province (2015-NY-007), the National Program for Support of Top-notch Young Professionals, the Fundamental Research Funds for the Central Universities (JUSRP51504), the Project Funded by the Priority Academic Program Development of Jiangsu Higher Education Institutions, and the Jiangsu province “Collaborative Innovation Center for Advanced Industrial Fermentation” industry development program are greatly appreciated.